My favorite moment of spring is the blooming of daffodils. But this year, I am adding a new highlight: the uplifting sound of…frogs. 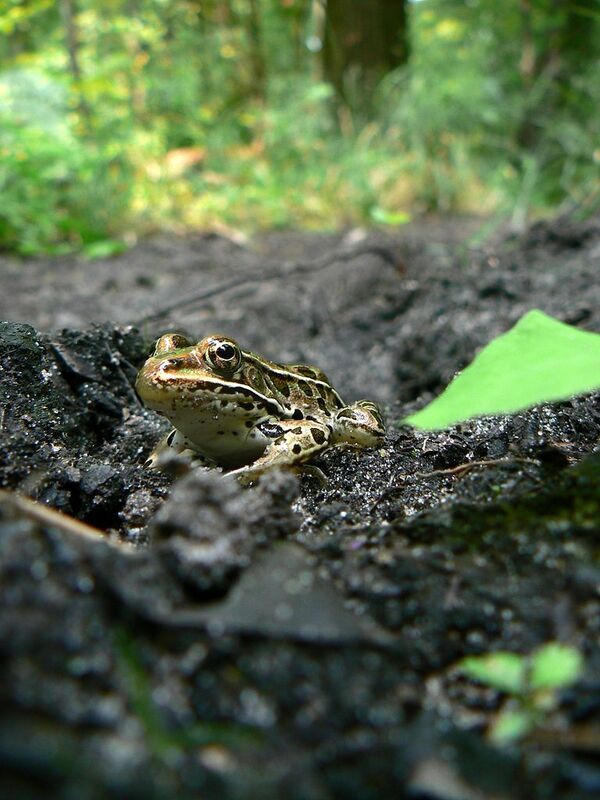 Learn more about local frogs, toads, and their calls. A northern leopard frog (Rana pipiens) peers at the camera suspiciously. Photo by Benny Mazur from Toledo, Ohio (Mister Leopard Frog) [CC-BY-2.0], via Wikimedia Commons. Working off the hypothesis that the Garden’s shoreline restoration efforts have helped increase frog and toad populations here, I turned to Garden scientists for answers. And this is what I learned: of the Garden’s 385 acres, nearly one-quarter (81 acres) is water. More than three-fourths of the Garden’s shoreline has been restored since 1999, addressing long-standing erosion problems. 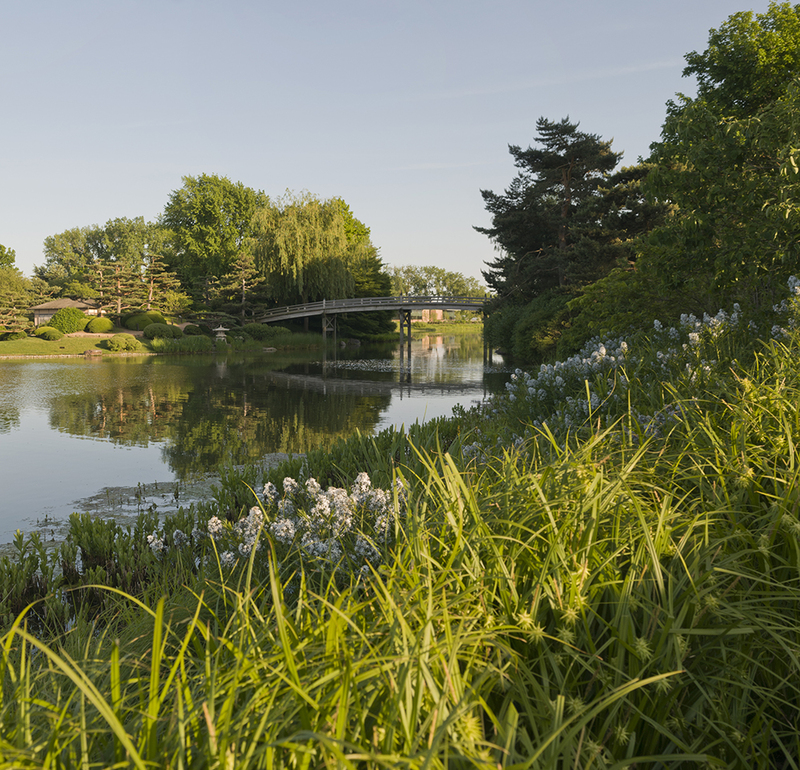 Most recently, the Garden restored 1¼ miles of shoreline around the North Lake; the ten-month project was completed in summer 2012. As part of the project, we added more than 120,000 native plants—the largest perennial planting project in the Garden’s history—to stabilize shoreline soil. The sturdy plants, some with roots more than 6 feet deep, resist erosion and enhance water quality by filtering eroded soil and excess nutrients. The renovated shoreline provides an enhanced habitat for our aquatic life, which includes wood ducks, double-crested cormorants, and snapping turtles, along with bullfrogs, American toads, and other members of their croaking chorus. Build a healthy habitat and they will come! Adding to the cacophony is an even bigger chorus than usual because of our “compressed” spring this year. Usually, the frogs emerge first, followed by the toads. This May, the frogs and toads are singing together—but not for long; come to the Garden soon if you want to hear them. Discover the details and challenges of our restoration project. Abloom in May, native plants and sedge create habitat, protect shorelines, and create a beautiful border around the North Lake. When I hear the frogs at the Garden from now on, I will think about how their return, spring after spring, announces that they’ve come home. I am proud that our conservation actions here have given them a healthy habitat in which to thrive, and I feel grateful to the frogs for giving me a moment to reflect on the importance of the Garden’s mission: We cultivate the power of plants to sustain and enrich life.